LioniX International (LXI) and Fraunhofer Heinrich Hertz Institute Berlin (HHI) will strengthen the collaboration of their Photonic Integrated Circuit (PIC) platforms by actively supporting the integration of both platforms together. Combining the functionalities of both platforms enables new applications varying from telecom, datacom to bio-photonics, sensing and metrology. Both platforms have their own unique properties which are complementary as was demonstrated in the realization of the world record ultra-low linewidth lasers (290 Hz linewidth). Both HHI and LXI will actively supply engineering resources to support the combination of both platforms. The PIC platform of LioniX International is based on stoichiometric silicon nitride realized by Low Pressure Chemical vapor deposition and is branded under the name TriPleX™. The platform is complementary to the Indium Phosphide (InP) platform of HHI as it is ultra low loss (from 405 to 2350 nm) and has the ability to create spot size converters enabling an optimized conversion between the mode profiles in for example HHI’s InP chips as well as many types of fibers. “Our unique hybrid integration capabilities support our customers that demand fully assembled Photonic Integrated Circuit Modules”, says Hans van den Vlekkert, CEO of LXI. ”With HHI we have found a supplier that supports our vertical integrated approach to our photonic IC module manufacturing”. The PIC platform of HHI relies on InP semiconductors, which offer a wide range of optical functionalities such as light sources, detection, amplification, and phase control in the wavelength region from 1200nm up to 1650nm. HHI´s portfolio of commercial products includes: high-speed photodiodes and balanced detectors, high-speed Mach-Zehnder- and other modulators, as well as a wide variety of laser products. In addition, HHI´s PIC platform for customer-specific PICs enhanced by LXI´s low-loss PICs allow for a large range of products targeting a wide range of applications. LioniX International: LioniX International is a leading global provider of customized microsystem solutions, in particular integrated photonics-based, in scalable production volumes. LioniX International provides customized solutions for OEM’s and System Integrators, from design to fully assembled modules, by vertical integration in scalable production volumes. LioniX International maintains its technology leadership secured by a strong IP position. 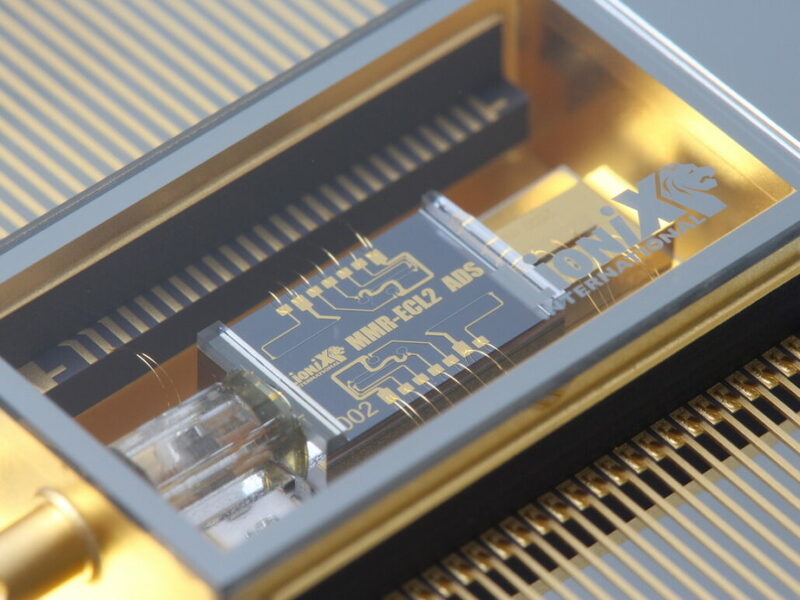 LioniX International focuses on Photonic Integrated Circuits (PIC) enabled modules based on its proprietary waveguide technology (TriPleX™), in addition to its other core competences micro-fluidics, opto-fluidics and MEMS. As a vertical integrated company LioniX International delivers a complete solution to its OEM customers: from initial design through volume manufacturing of products. The Fraunhofer Heinrich-Hertz-Institute: Fraunhofer HHI does research on communications since nearly 90 years. Nowadays, about every second bit transported in the internet touches HHI InP technology on its way to the receiver. With a strong focus on InP, HHI also develops polymer waveguide based hybrid integration and silicon photonics. While the HHI expertise is strongest in high performance (100GBit/sec and above) data- and telecom, HHI has strongly increasing activities in sensor systems, e.g. based on terahertz technology. HHI regularly offers MPWs (multi-project wafer runs) in InP. HHI’s partners have the choice to do the design themselves and just use HHI as a foundry or to get both design and chips from a single source.